Growing up in Nigeria, I remember how parents deemed the Afrika Shrine off-limits. Shrouded in mystery, with rumors of being a hedonistic drug haven during the eighties, there was an air of mystique that hung around a 20 mile radius of the club. 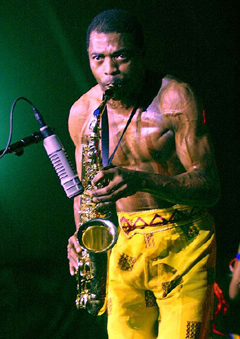 It wasn’t until years later, when I watched a shirtless Femi Kuti drenched in sweat manically playing a saxophone with the legendary beaded Kuti dancers gyrating at a dizzying pace, that I began to get a sense of what his father, Fela, must have been like during his heyday. Uncanny physical resemblance aside, Femi seemed to have been channeling his father’s spirit on stage. Arguably the Elvis Presley of Africa in terms of fame, Fela Kuti’s invention of Afrobeat – a fusion of rhythmic jazz beats overlain with Yoruba music – in the early sixties transported raw West African traditional sounds to a global landscape. Born Fela Ransome Kuti to a feminist and a Reverend, Fela left to study at the Trinity College of Music in London at the age of 19. It was during his years at Trinity when he formed his first band, Koola Lobitos. Years later, he would establish a nightclub in Ikeja, Lagos called “Afro-Spot” as his base for playing his new wave of music he called “Afrobeat.” In 1971, Afro-Spot became the Afrika Shrine, where he performed regularly. He would later form a new band called Egypt 80. By 1978, he had married 27 women, mostly his backup dancers and singers, as a protest against frequent raids on his Kalakuta Republic compound by the government ,which wasn’t too keen on his musical content. He would later rotate the number of wives he kept – keeping 12 at a time. Fela died of complications resulting from HIV/AIDS in 1997. Revered as “Baba,” which means “Father” in Yoruba, his ardent supporters see him as an oracle and pay homage to his shrine before important journeys or meetings. 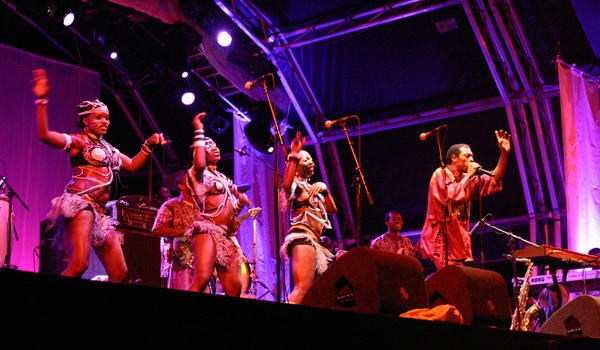 Many of Fela’s children have followed in his musical footsteps. The most popular isFemi Kuti, whose striking resemblance to his father and raw, unadulterated energy behind the saxophone is reminiscent of classic Fela with a modern edge. Seun Kuti, also a saxophonist and vocalist, and Fela’s youngest son, now leads his father’s former band, Egypt 80. Yeni Kuti, Femi’s older sister, fondly known as YK Power, actively scouts out some of the most talented hip swaying backup dancers for Femi’s performances. As compound aides showed us around and took us backstage, they kept marveling at pictures they’d probably seen a couple hundred times, paying homage to every photograph of “Baba” we passed. Their reverence was undeniable. We ran into Yeni Kuti at the compound. A quick phone call was made to Femi to see if he could meet with us for an interview. 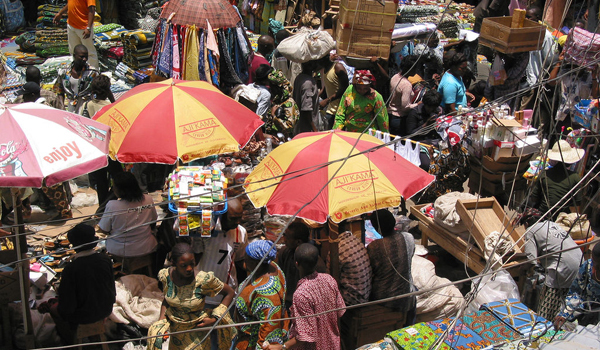 Unfortunately, a mild case of malaria kept him in bed through our visit to the shrine. I got the sense that once you walked in through the doors of the compound, you were instantly treated like family and the Kutis were open and readily accessible to you. An internationally acclaimed artist in his own right, Femi puts on free performances every Tuesday and Thursday night. Rehearsals start at 9 PM; dancers are followed by a full show, which ends between 12 AM and 1 AM. Every Friday night the Shrine puts on a free disco night called Gobe Night; an estimated 10,000 people pass through its doors on Gobe Nights. Admission to performances at the shrine is free of charge except on Sundays when a 500 Naira* cover charge is required. Read Fela Kuti’s full biography with links to related articles. Visit the Afrika Shrine online. View clips of Fela Kuti and Femi Kuti performances on YouTube. 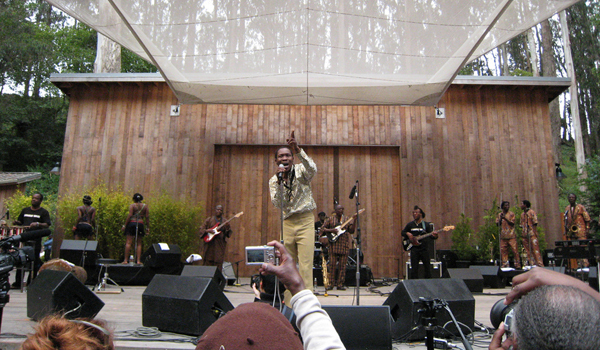 View 2008 European tour dates for both Femi and Seun Kuti.